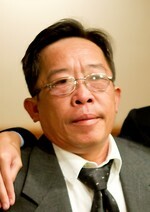 PENSACOLA – Mr. Sứ Văn Nguyển, 58, passed away on June 30, 2018. He was born on August 4, 1960 in Mang Thit, Cai Nhum, Việtnam to Nguyển Văn Bính and Huỳnh Thi Lủu. He is preceded in death by his parents, brothers Nguyển Văn Tính and Nguyển Văn Lục, sister Nguyển Ngọc Mai and. He is survived by his wife Nguyển Bích Vân “Thảo”, son Tuấn Dinh Nguyển of Pensacola, daughter Alicia Vi Nguyển of Austin, Texas, sisters Nguyển Huệ Watson and Lan Thi Nguyển of Pensacola and brothers Nguyển Văn Lời, Nguyển Văn Hội, Nguyển Văn Nhứt, Nguyển Văn Ẩn and sister Nguyển Ngọc Hủỏng of Việtnam, as well as numerous nieces and nephews in America and Việtnam. Growing up Sứ was the brother who was into mischief, but he was beloved by all. He was always ready to lend a hand and help others. After the war, life was hard for the Nguyển family, but especially for Sứ. So, he decided to escape out of the country and come to America to be with his sister Huệ, who had emigrated in 1972. Sứ and Thảo along with others left Việtnam by boat and arrived in Thailand. After spending nearly two years in refugee camps in Thailand and the Philippines, during which Sứ and Thảo got married and had a son, they came to America in 1988. The family settled in Pensacola, his older sister’s adopted hometown. Although he spoke almost no English, Sứ set about immediately to find work and support his family. Already skilled as a welder, he quickly proved his ability and proceeded to work as a contractor over the years for a variety of companies in Northwest Florida, such as Joe Patti Shipyard, Solutia, Air Products and Champion Paper Mill, to name a few. Over the years, he established a reputation as one the most skilled welders in the area. Sứ was a good worker who was proud of the fact that he never had to depend on government assistance and was always able to provide for his wife and children. Sứ never got over longing for the home he was forced to leave behind in Việtnam, especially because of the family he had to leave behind. He was pleased, however, when he was later joined by his sister Lan. Sứ did adapt to America in his own way. While he enjoyed his Việtnamese home cooking, he also developed a real fondness for bacon cheeseburgers. He readily took to blue jeans and baseball caps and regretted having to give up his Oakley’s when his eyesight forced him to wear prescription glasses. He also continued his ways of being ready to lend a hand to anyone. He was soft spoken, friendly, wry in humor, a good provider and will be sorely missed by his family and friends. Visitation will be Saturday, July 7, 2018 at 10 a.m. at Little Flower Catholic Church. A funeral mass immediately follows at 11 a.m. with Father Matthew Worthen officiating. In lieu of flowers the family requests donations be made at the Catholic Church of your choice for masses in the name of Sứ Văn Nguyển. To send flowers to the family of Sứ Văn Nguyển, please visit our Heartfelt Sympathies Store.